Do you remember back in February when I had the pleasure of traveling to Texas to visit the Dallas set and attend the J.R. Ewing Bourbon unveiling? Exciting news, the line of bourbon has officially launched to the public! 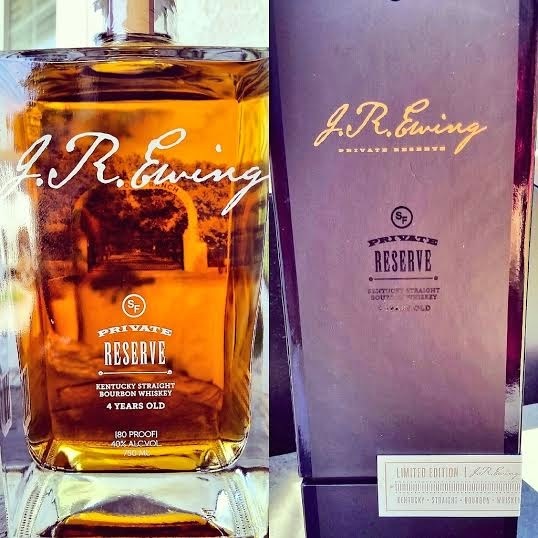 J.R. Ewing Bourbon is a true bourbon whisky, distilled in Kentucky and aged four years in oak barrels. Mixing corn with hints of caramel, vanilla, oak, and orange, the flavors are just right for a Bourbon and Branch indulgence. I'm not a big fan of dark alcohol, but was pleasantly surprised with the taste of this bourbon and found myself enjoying the drink. There's just something about sipping on bourbon that makes you feel badass. I see why it was J.R.'s favorite. From the original to new version of Dallas, he was known for his love of a stiff drink so it only made sense to craft an exceptional bourbon in his honor. If Mr. Hagman were alive to see his famous charater's namesake adorn this attractive bottle, complete with a Southfork image, I'm sure he'd be awful proud. To find a local J.R. Ewing bourbon retailer, check the availability map on the site. Cheers! It takes a badass to sip on Bourbon! You go girl! Not going to lie this looks good! I'd love to try it! So cool! I'm not a bourbon drinker but I love me some Dallas!